Meditating in this backyard? Don't have to ask us twice. 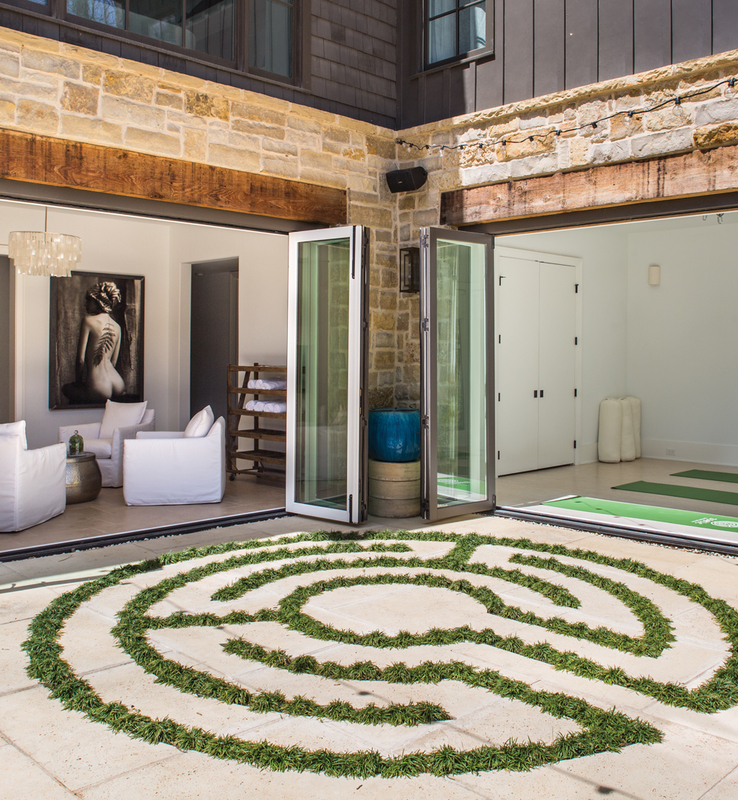 “A labyrinth is a metaphor for life’s journey,” says Mathis, whose meditation classes include labyrinth walks. The pavers and mondo grass were installed into the ground so a table and chairs can be placed on top for entertaining. An adjacent sitting area has limestone floors, Sunbrella-covered swivel chairs, and a table for snacks, making it cozy for both yoga clients and family time. Mathis’s yoga studio features bifold doors, light cork floors, and all-white walls to help keep the space light and airy. Cedar beams above doors, strings of LED lights, and art by photographer (and neighbor) Rob Brinson add ambience to the peaceful space. Don’t forget sound as another soothing element: A turquoise ceramic fountain in the corner provides a constant water gurgle, and installed speakers are at the ready for streaming music.